Schwarzkopf Got2b have released a straightening blow dry kit called 'got2b play it straight'. got2b play it straight is a semi-permanent solution to rebellious, unmanageable hair. Play it straight contains a special protein that helps loosen the bonds that make hair frizzy and also contains keratin, silk and wheat proteins in order to keep hair cared for and conditioned, seal in lasting smoothness and create a weightless, humidity-resistant barrier to frizz. To watch the Play It Straight 'How to' video visit here. 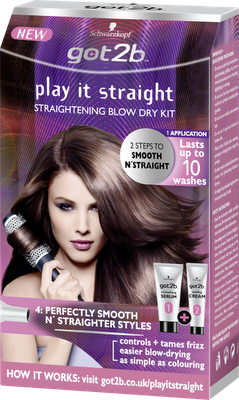 Got2b play it straight is priced at £6.99 RRP and available now from Boots, Superdrug, Asda, Savers and Amazon. Have you tried this or seen it in the shops yet? I would love to know your thoughts! I actually just tried it last night. I missed out the final 'blow dry' step because I didn't want my hair to lose its curl completely. Its certainly straightened my hair a little, and smoothed it the tiniest bit, but it hasn't dont too much other than highlight how split my split ends are! I'll definitely try it again for the price, got it for £2 in ASDA, and do the blow drying step at the end. It would probably work better for wavy hair rather than full on curls. What do you think of it? Sounds good!